Chad was diagnosed with Type One Diabetes in 1974 at the age of 23 months. He has been an avid biker since he was just a little guy. His cycling career started with BMX racing and evolved to include mountain bikes (downhill, dual slalom, and cross country). Recently he converted to Single Speed Mountain Biking. When not dodging rocks and trees in the woods - he is in training for the Ride to Cure Diabetes. Chad (a type 1 rider) has completed 19 Rides to Cure Diabetes... including the Death Valley venue (11 times) and Killington Vt, Tucson Az, LaCrosse Wi (2 times), Burlington Vt, Amelia Island Fl and Saratoga Springs NY (2 times). He was diagnosed with Type One Diabetes in 1974. He is also a member of Bike Brothers Bike Shop Racing Team. 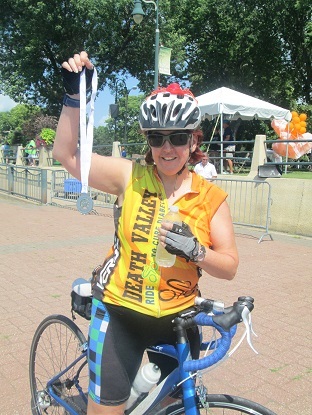 She has successfully faced the challenges that Type One Rider's need to overcome in managing their blood glucose levels during long endurance cycling events... and has done so with a smile on her face at all times - as she encourages other riders to do the same. At the 2016 Amelia Island Ride. 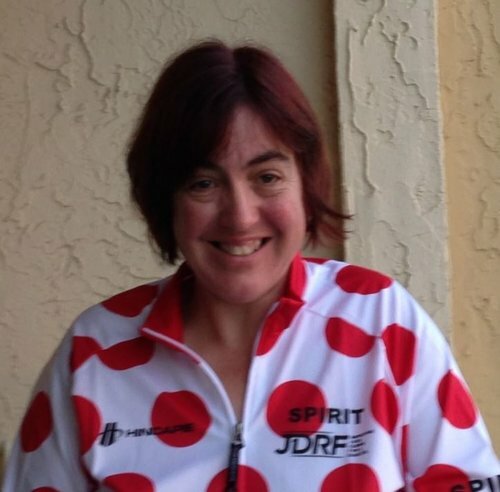 Melissa was selected to receive the JDRF Spirit Jersey for exemplifying the "Spirit" of the ride. She also serves on the Hudson Valley JDRF One Walk committee. Donna is a co-founder of Ulster County JDF (1975). In addition to being on the Hudson Valley JDRF ONE WALK committee she has been an ardent supporter of the ride since the days when the team was just known as "Chad and Dad". She has been volunteering at JDRF Rides for 8 years by providing support at checkpoints in Death Valley as well as La Crosse, Tucson and Amelia Island. Volunteers at checkpoints provide assistance with nutrition and first aid while dealing with extreme weather conditions. She has been knitting her fingers to the bone creating scarves to be sold at events such as our Pancake Breakfasts Fundraisers... where by the way she is flipping pancakes to feed the throngs of hungry JDRF supporters who arrive to support our efforts. Without her support and encouragement, our family team would not be able to accomplish what it has - and hopes to be able to continue to do. Dad converted to cycling in 2002 to ride with Chad as "Team Chad and Dad" at Death Valley. He fell in love with the event and the passion of that all the riders have for this cause. Like Chad, he has completed 19 Rides to Cure Diabetes... including the Death Valley venue (11 times) and Killington Vt, Tucson Az, LaCrosse Wi (2 times), Burlington Vt, Amelia Island Fl and Saratoga Springs NY (2 times). 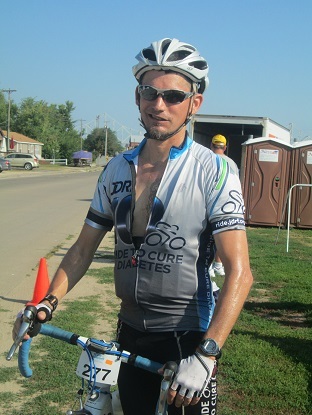 At the 2015 La Crosse Ride, he was honored by being given the event's "Promise" Jersey. In 2016, he became a certified USAC Cycling Coach in order to provied support for chapter training rides and assisting riders the day of the events. He has coached at Burlington, Amelia Island, La Crosse and Satatoga Springs. 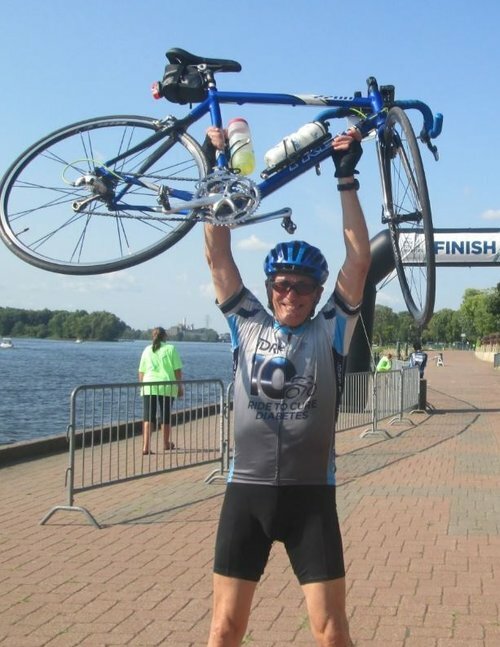 If all goes according to plan, Charlie will be completing his 20th ride by participating in the Saratoga Springs (NY) Ride To Cure Diabetes this September -- followed by his 21st Ride at Amelia Island Florida in October. Here's Melissa sporting her JDRF Spirit Jersey. She was awarded this jersey at the 2016 Amelia Island Ride. 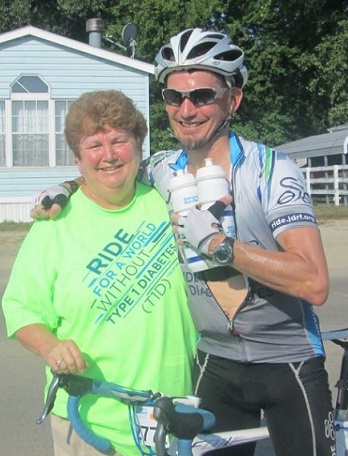 She was selected to receive the JDRF Spirit Jersey for exemplifying the "Spirit" of the ride. In early 2017, he was selected by JDRF International as a T1D Champion. The online article states "Chad was diagnosed with type 1 #diabetes just days before his second birthday in 1974. Back then, glucose control and decisions about insulin doses were based on testing urine collected from his diapers. His projected life span and likelihood of complications was statistically bleak. Chad has been an avid biker since he was little. He has raced BMX, mountain bikes and recently Single Speed Mountain Bike competition. Chad completed the Death Valley Ride 10 times as well as other JDRF rides. In 2016, he lost most of his vision in the right eye as a result of #T1D complications. 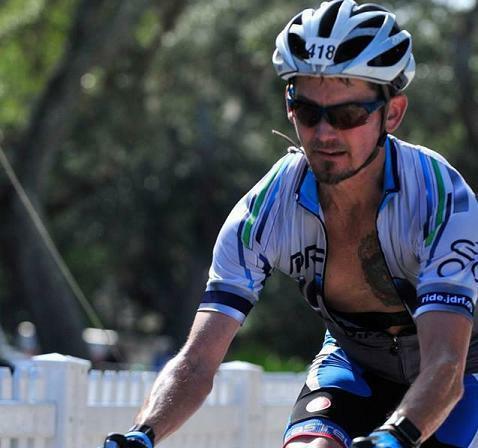 While training for a JDRF 2016 ride - he endured an arduous series of monthly injections in his right eye to restore his vision. Despite 43 years of trials and tribulations with T1D, Chad remains steadfast to not letting T1D limit him. He serves as an example to others who need inspiration. For that, we consider Chad a T1D Champion."